It’s a well-known fact: Quebec is the only French-language province in Canada. 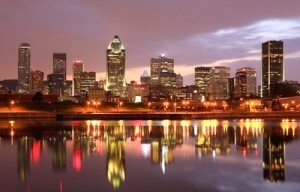 According to recent statistics, la belle province is home to over eight million inhabitants. Of these inhabitants, 78 per cent are native French speakers and over seven per cent are English speakers. In the Greater Montreal Area, 47 per cent of residents identify French as their mother tongue as opposed to 16 per cent who state English as their native language. It’s not surprising to learn that most language professionals work in French. Quebec’s association of independent workers and small businesses in language services, ATAMESL, revealed in its 2012 survey that 83 per cent of editors and 58 per cent of translators work in French, compared respectively to 26 per cent and 49 per cent who work in English. Given these statistics, I wanted to ask colleagues what they thought about working as English-speaking professionals in this province. I’ll open this series by sharing points of view from colleagues in the Greater Montreal Area. Stephanie Watt is an editor and indexer at Recto Verso Editing. When asked about the challenges she faces in finding English editorial work, she said many mistake her as a translator when she explains to clients that she is an editor. “Perhaps people conflate translation, revision and editing,” she says, adding that some may see editing as irrelevant in a bilingual context. She suggests that “we set up as mutually exclusive révision comparative and révision linguistique, where the former is concerned with translated texts and the latter with unilingual texts.” If this is true, how would one describe the process of spotting errors or inconsistencies in spelling, punctuation, abbreviation conventions, capitalization or presentation of numbers? “Wouldn’t révision linguistique be considered copy editing?” she asked. Such a process zeroes in on content — the very substance that glues documents together. Whether a text is translated or written, editors, translators and writers work with content. This is why Watt considers revision and editing essential in bilingual environments. Zoë Blowen-Ledoux is an English freelance language professional. Seventy per cent of her work involves translation. However, she provides editing as a secondary service, even though most editing takes the form of revision. In other words, she works with texts written by non-native English writers. From this perspective, her work doesn’t focus on content, but on language. Watt has a tendency to work with clients whose first language is neither French nor English. Many clients use Watt’s services when they receive substandard work from either an individual who believed that being bilingual was enough to work with two languages or a professional translator who provided unacceptable services. “Hiring a translator and then an editor shows a desire to communicate in correct English,” she says. Next stops: Western Quebec and the Eastern Townships. “Population by year, by province and territory.” Statcan.gc.ca. Statistics Canada, 29 September 2014. Web. 12 October 2014. <http://www.statcan.gc.ca/tables-tableaux/sum-som/l01/cst01/demo02a-eng.htm>. “Language: Population by Mother Tongue, 2011.” Quebec. Institution de la statistique du Québec. Québec Handy Numbers, 2014 edition. Quebec City: Library and Archives Canada, Bibliothèque et Archives nationales du Québec (2014) : 14. Print. Association des travailleurs autonomes et micro-entreprises en services linguistiques : Rapport de l’enquête sur les conditions de travail et tarifs des langagiers en 2012 (2014) : 8. Print. 5 Responses to "English Editing in Quebec: Local Realities — Montreal and Area"
A most interesting post, Dwain. I’ve long wondered how, or whether, editing differs from revising a translated text. Your exploration of the boundaries (or lack thereof) is eye-opening. Looking forward to more! Thank-you for your kind comment, Frances! It’s hard to draw a fine line between editing and revision for reasons mentioned in the text. Whether you’re a writer, translator, or editor, I have noticed that the two practices often overlap. Businesses try to make a distinction among revision, editing, proofreading, and copy editing in their job postings, but the staff is simply tying itself in a knot. By pointing out that language and content complement each other, we can (at last?) put an end to reserving one practice for some professionals and one practice for others. Thank you very much for this post. I have appreciated the difference you have clearly made between “révision comparative” and “révision linguistique”. Could you further define what you mean by content? In my opinion, “content” deals with various concepts, such as text structures (narrative, argumentative and informative texts) and the knowledge inserted in texts. As for France, I look forward to reading more on this topic. Thanks for your feedback, Sylvie. I can’t say that “révision comparative” and “révision linguistique” are different. As I mentioned in my reply to Frances, the two practices [often] overlap, even though translators mainly work with language, and editors with content. With respect to content, you’re right to suggest that it deals with structure and style of any given text. I don’t think knowledge can be considered a concept related to content. Knowledge of the subject lies with the language professional in charge of the project at hand.